In many cities, an old and run down section of it is able to offer cheap accommodation and low rents, and thus attracting the poorer people. Often the place is dominated by an ethnic community, recent immigrants or a minority group. This is one way how ghettoes are formed. The other way is to employ architects to design a massive housing complex specifically for a particular disadvantaged group, and then pour in public funds to build it. Originally at Pruitt Igoe, there was to be two sections, Pruitt was supposed to be for blacks and Igoe, for whites, but this was ruled by the Supreme court to be unconstitutional. So the scheme opened in 1954 as an integrated community. But the whites voted with their feet, and relocated elsewhere: left behind were the black and poor. 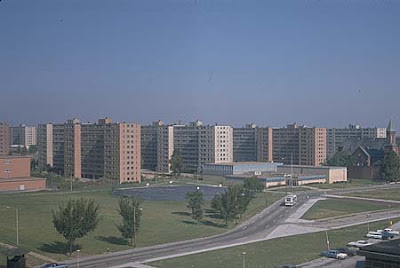 In his 1970 book "Behind Ghetto Walls," sociology professor Lee Rainwater condemned Pruitt-Igoe as a "federally built and supported slum........condens(ing) into one 57-acre tract all of the problems and difficulties that arise from race and poverty and all of the impotence, indifference and hostility with which our society has so far dealt with these problems," Rainwater wrote. Putting together in one location, a lot of financially stressed families, was a bad idea that was going to have plenty of unintended consequences. Add race, and it became a disaster.